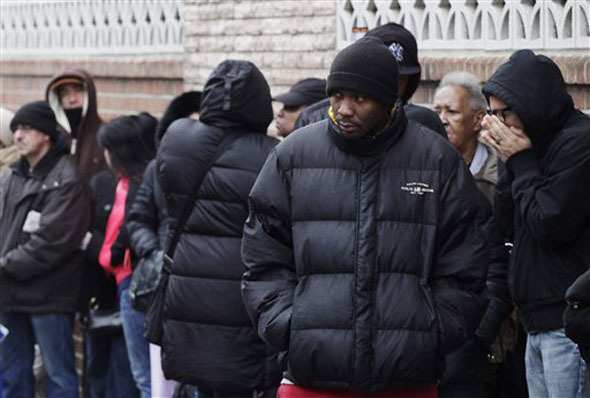 People wait in line to enter the Northern Brooklyn Food Stamp and DeKalb Job Center on Friday, Feb. 24. Photo by Mark Lennihan, AP. HOST INTRO 1: New York Governor Andrew Cuomo vowed in his State of the State address in January to get rid of a practice he thinks is invasive and unfair. HOST INTRO 2: New York State started doing this in 1996 to prevent fraud and clerical errors, but stopped in 2007. Only New York City requires it now, along with the state of Arizona. California and Texas recently passed laws to end the practice. New Yorkers are divided on the issue, but there’s at least one strong advocate: Mayor Michael Bloomberg. Annie Russell reports. RUSSELL: June Scott is waiting to meet with her social worker in a sunny Hell’s Kitchen office. She’s 38, and has a disability that allows her to collect Social Security Income. She’s here today because she wants help finding a job. She says fingerprinting is an invasion of privacy. ACT (SCOTT 1): If you want food, and you can’t afford to buy food, why should you be fingerprinted for that? That doesn’t make any sense to me. RUSSELL: Scott isn’t on food stamps right now, and says she would not apply if it meant she had to be fingerprinted. This is one of Cuomo’s big points. Just over a million New York City residents are on food stamps, but he says an additional thirty percent are eligible. He thinks fingerprinting scares them away. June Scott’s social worker, Yan Bennis, isn’t so sure. He helps his clients apply for food stamps all the time. ACT (BENNIS 1): I think that as long as it prevents fraud and everything else I think it’s worth it and we would wind up saving money that way. RUSSELL: Mayor Bloomberg agrees. On his weekly show on WOR Radio last Friday, he said the policy saved the city 5 million dollars last year in overpayments. It’s not clear whether those were fraud or errors, but he says the savings prove the policy is working. ACT: (BLOOMBERG 1): It’s no stigma because all of our city employees do it. Most companies do it in this day and age. I don’t know who doesn’t. It’s not painful, it doesn’t take any time. RUSSELL: City employees are fingerprinted, but that’s not the case everywhere. A spokesperson for the company the mayor founded, Bloomberg LP, said it does not fingerprint incoming employees, but uses fingerprinting for computer access. Social worker Yan Bennis adds that most people on food stamps are never fingerprinted. Anyone who applied before 1996 was grandfathered in. But if Cuomo wants to get rid of the practice, he may have more support in 2013. Everyone who’s expressed interest in running for New York City mayor next year agrees that fingerprinting should stop. Annie Russell, Columbia Radio News.